One of the best electro rarities that I've heard. I also have a sneaking suspicion that this could be the sample base for something I've heard recently although I can't place it. Perhaps something outta the Stones Throw/Dam Funk/Tony Cook camp, but not sure. If it isn't, it's certainly right in the same vein. Or, perhaps I'll dust off the sampler and get to producing my daughter's new LP. Laugh out loud. This one doesn't seem to turn up too often and doesn't make the usual rounds in the electro circles. 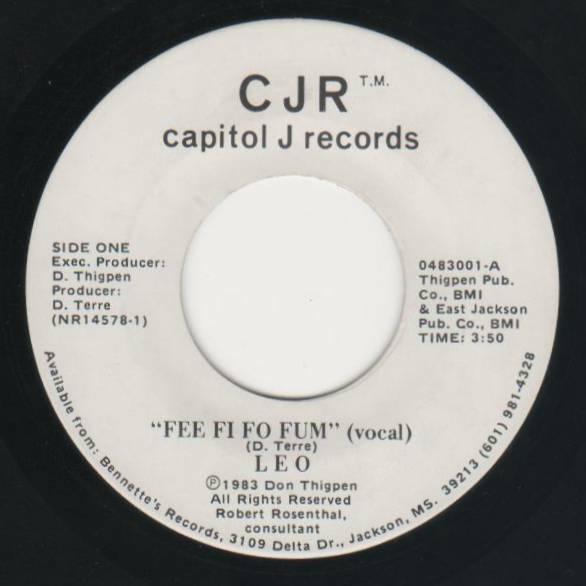 Could be that this was only on 45, and as most electro records were released on 12 inch to the DJ communities back in the day, this particular jammie flew right under the radar. I'm only posting the vocal version, but the instrumental is a complete monster as well, so you should seek it out. Few folks know about this one, so if you search now, perhaps you'll find a copy before the price escalates. If this is your cup of tea that is. This post marks our 66th post so far this year. We've already exceeded our quota for the year. We're not even half the way through the year, yet we've matched the amount of posts we've done for the previous years. We're well on our way to double what we've done previously. So, we're doing good. And, if you agree, we haven't been slipping on the quality either. There's no sign I'll be letting up anytime soon. So, it's gonna continue to be a fruitful year. Happy Spring to you. ENJOY!